Richard Welsh and Mike Stilwell of Modoc Contracting install new signs at the newest park in downtown Klamath Falls. March 15, 2018 (Brian Gailey). 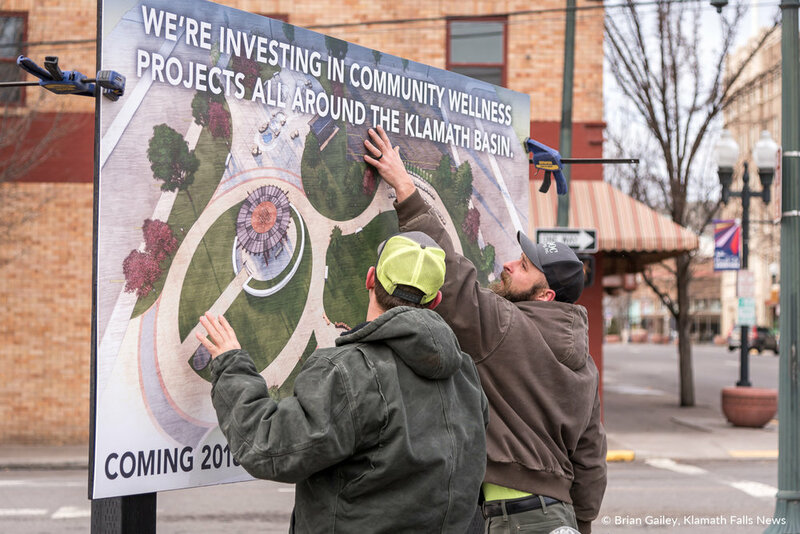 Signs at the site of a new park on the north end of downtown Klamath Falls show the designer’s concept of its features and also mark another step in the park’s progress from vision to reality. Project coordinators from Sky Lakes along with a crew from Modoc Contracting installed the signs today (March 15) to help people visualize how the one-block area bordered by Main Street, Klamath Avenue, and 11th and 12th streets will be transformed by the park. 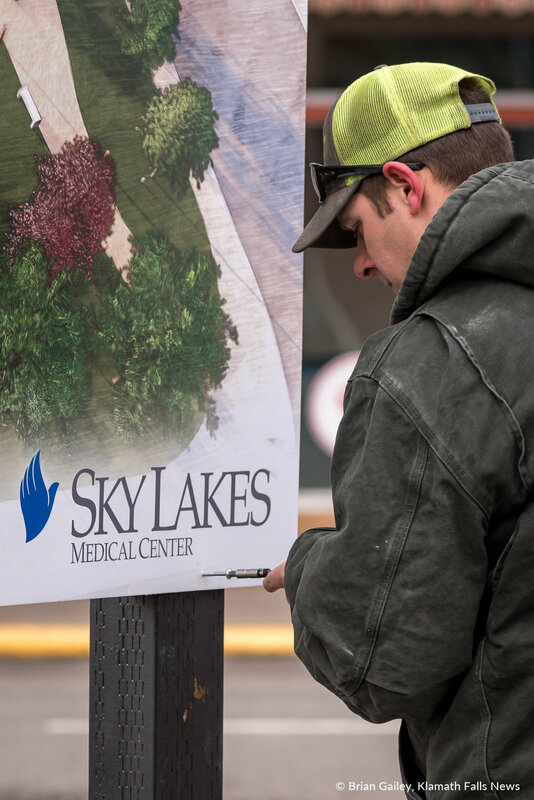 Sky Lakes is developing the park adjacent to the Live Young Sky Lakes Wellness Center, where the late Stephanie Van Dyke, M.D., was medical director, in cooperation with the city of Klamath Falls. “The Sky Lakes investment in the park is an illustration of the organization’s commitment to the people and the community it serves, to health, and to the legacy of Dr. Van Dyke, whose vision of additional green space and dedication to wellness serves as a guiding philosophy,” said Lauren Jespersen, Sky Lakes Foundation director. Dr. Van Dyke died in a sledding accident in January 2016. A memorial to her will be installed near the park’s southeast entrance. Designers at ZCS Engineering & Architecture have included expanses of lawn and a small amphitheater for park performances and activities, a water feature that includes a splash pad, and spaces that invite an assortment of physical activities. The Klamath Falls Parks Board in February considered still-developing plans for the park, and the Klamath Falls City Council reviewed its progress during a work session earlier this month. Groundbreaking could be as early as this spring, pending approval by the council, with completion possibly by fall. Donations for the park can be sent in Dr. Van Dyke’s name to the Sky Lakes Medical Center Foundation, 2865 Daggett Ave., Klamath Falls, OR, 97601, or online at the Giving Center in the Foundation section of SkyLakes.org, or at gofundme.com/stephaniespark.